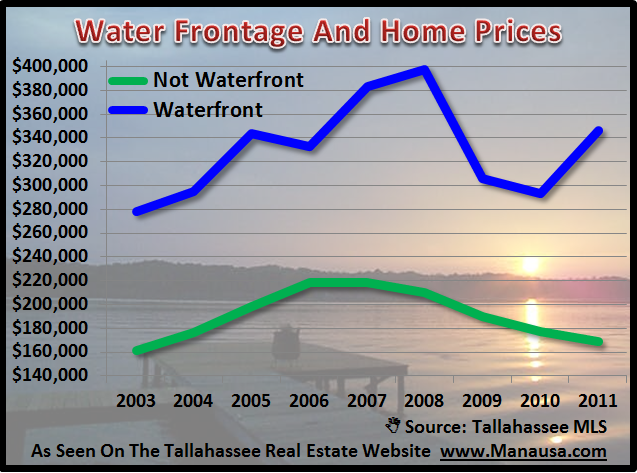 As I was digging through recent sales of Tallahassee waterfront homes, I noticed a trend that seemed to be contrary to the rest of the Tallahassee housing market. Could it be that I have discovered a niche in our Tallahassee neighborhoods that is performing well? We have several clients who are looking to buy a home on a lake in Tallahassee, so I just wanted to make sure we were up to speed with this special part of the market. 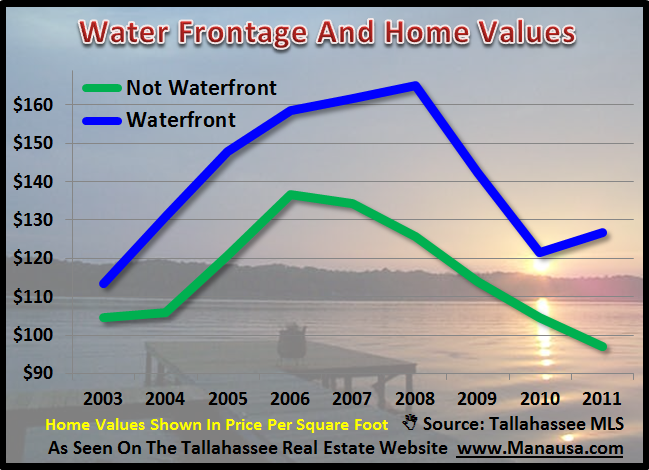 I looked at recent transactions involving Tallahassee waterfront homes and found that they appear to be appreciating, even as the non-waterfront homes continue to decline in value. The map below shows all waterfront home sales in the Tallahassee MLS from this year. Reminder: If you receive the Tallahassee Real Estate Blog by email, you need to click-through to use the Map feature. The average sales price of Tallahassee waterfront homes in 2011 has been 346,000, which is an 18% increase from the $293,000 average price recorded in 2010. During the same period of time, the average sales price of non-waterfront homes in Tallahassee has fallen 5% from $177,000 to $168,000. 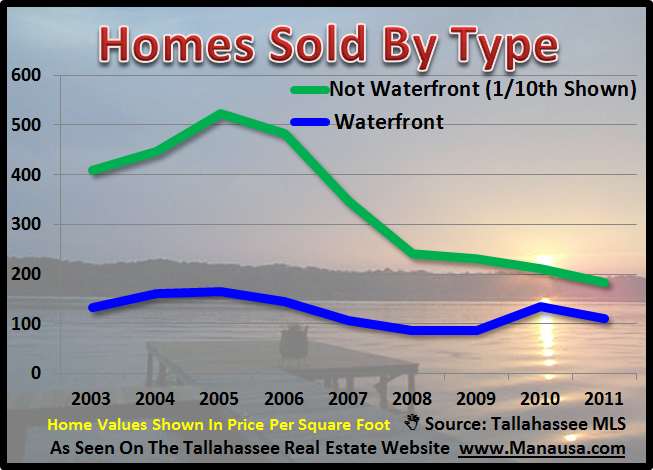 The average value of Tallahassee waterfront homes sold in Tallahassee is the big surprise for today's report. As we see in the real estate graph below, the average value of homes on the water has risen 4% this year, from $122 per square foot in 2010 to $127 per square foot this year. Non-waterfront homes in Tallahassee have not been as fortunate, with values declining 7% from $105 per square foot last year to $97 per square foot through mid November 2011. The last "check" I needed to make was to compare the total number of Tallahassee waterfront homes sold this year with years prior, in order to see if unit sales had died off. This (fortunately) is not the case. It appears as if the number of waterfront homes in Tallahassee that will sell this year will be lower than last year, but we can already see that more have been sold than in any of the three years prior to 2010. I would say this final piece of the equation bodes well for people who have homes on lakes and ponds in Tallahassee.